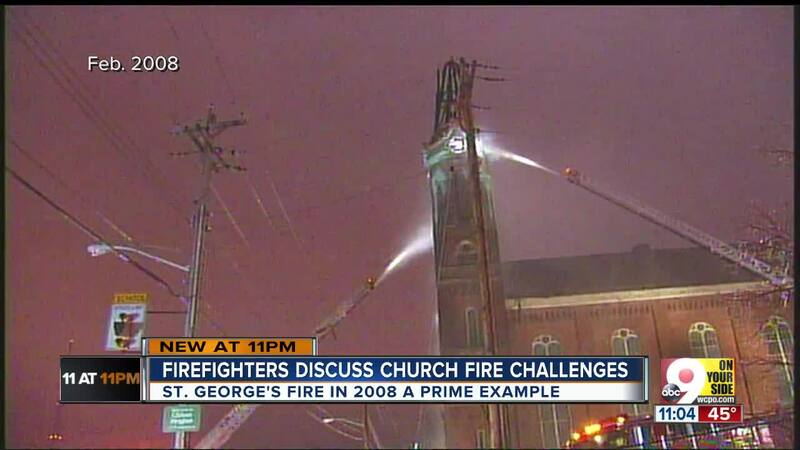 Built in 1873, Saint George’s Catholic Church is only a fraction as old as Notre-Dame; the fire that engulfed its blue copper spires Feb. 1, 2008, endangered a much smaller portion of the planet’s religious heritage. The challenges the firefighters in both cities faced, however, were the same. CINCINNATI — Built in 1873, Saint George’s Catholic Church is only a fraction as old as Notre-Dame; the fire that engulfed its blue copper spires Feb. 1, 2008, endangered a much smaller portion of the planet’s religious heritage. “You go into a mode of, ‘What can you save? What can you do? What’s too far gone?’” Cincinnati Firefighters Union Local 48 president Matt Alter said. The fire was visible for miles that night, the spires blazing like twin torches above a chilly Clifton. When Alter pulled up, he and his fellow emergency responders were forced to weigh their own safety against preserving an iconic building — one built with narrow, hard-to-navigate staircases and dried timber that burned as fast as it did hot. Crews that ran inside to run hose lines through the interior of the building were called out just as quickly, he said. It was too dangerous. The steeple was beyond saving. The only option was to keep fighting for hours, knowing parts of the building would inevitably collapse, and try to save as many artifacts as possible. “You’re on your game, so to speak,” he said. There’s so many hazards, so many things are posed. You’re dealing with an emotional element. The firefighters are feeling the emotion. … This is an iconic structure. A place of reverence and worship for people. It’s literally going up in smoke right before their very eyes." The scene replicated itself in bold Monday in Paris, where people all over the world watched the iconic Notre-Dame bleed fire and smoke into the sky. Like their counterparts in Cincinnati, the Parisian firefighters prioritized artifacts — the Biblical crown of thorns among them — and containment, realizing early on that the most badly damaged spire was doomed to collapse no matter what. Also like their counterparts in Cincinnati, Parisians plan to restore the old building. French President Emmanuel Macron treated the fire as a national emergency, rushing to the scene and canceling a previously scheduled televised address meant to address France’s yellow vest crisis. He later pledged to rebuild the cathedral, which he called “a part of us,” and appealed for national and international help to do so.